As I watched dozens of high school juniors file into Memorial Union this morning, it reminded me of my first visit to Washburn as a prospective student (that’s me above, with hair, as editor of The Review). 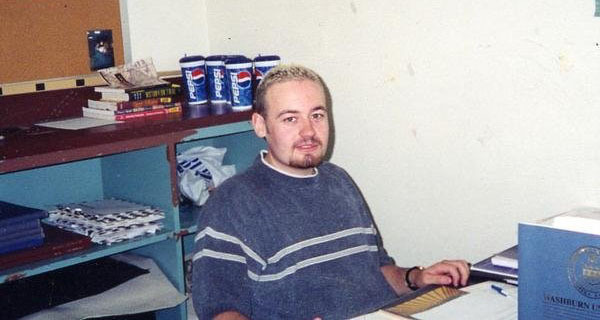 That was centuries ago (1996), but the memory is as vivid as if it happened yesterday. I remember it well because I wasn’t here long that day. As a transfer student from Allen County Community College, my father and I were on campus to survey the setting. We left about two hours in when we heard — incorrectly — that many of my credits weren’t going to transfer. The drive back to Burlingame was not a comfortable one. I wondered where I was going to go next. I’d already left Kansas State after a year. Too big, not enough interaction with my professors. So a “big” school was not an option. I remember calling Emporia State … no journalism degree. Strike two (strike three for ESU). But my angst didn’t last long. Just minutes after we’d arrived home, I got a phone call from the director of admissions at Washburn. He assured me that the credits would transfer and asked that I come up the next day for a one-on-one meeting. So I drove back to Topeka the following day and spent a few hours touring campus, including a visit with the dean of the mass media department. Those interactions, that personal attention, the caring … that sealed the deal for me. I chose Washburn that day and have been grateful for that decision since. I owe those folks a debt of gratitude for going out of their way to get me here. Washburn is a special place. We offer experiences most schools simply can’t. Don’t be afraid to share your stories with the prospective students here, as well as the ones who will be here in the future. Everybody here has an important role. When folks visiting Washburn see that, they often fall in love with this place. Serving as a campus guide, making phone calls for Dollars for Scholars, attending class, running six miles around campus, mowing lawns – you name it, chances are Ken Calwell did it as a Washburn student. 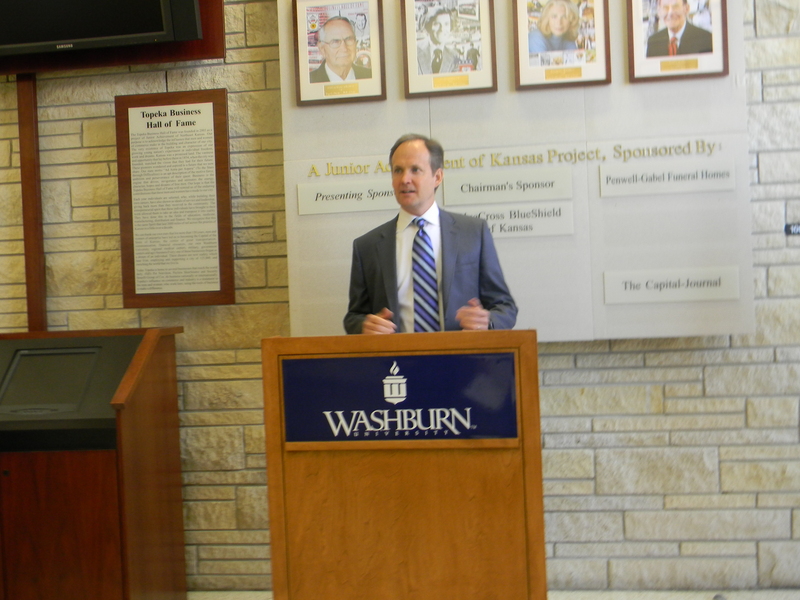 “A lot of the students were like me; Washburn fit into our lives,” said Calwell, the 2013 Oscar S. Stauffer Executive in Residence. “Washburn was wonderful from a lot of perspectives, from the size of the school, to the ability to really get to know the professors. I actually became pretty close friends with two of my professors. Calwell, bba ’84, Portland, Ore., has made the most of what he learned at Washburn, building a successful career as a marketing executive at several restaurant franchises. He worked as an executive at Dominos, Wendy’s, Pizza Hut, FritoLay and Pillsbury, and is the president and chief executive officer at Papa Murphy’s International. He attributes his career to this education and a message his father delivered often. Calwell’s ascent to his current position came with obstacles. In the early 1990s, he overcame a biking accident that resulted in multiple broken bones and skull fractures. While he and a friend were training for the national triathlon championships, a driver fell asleep at the wheel, crossing into their lane and resulting in a head-on collision. “We were biking out toward (Derby, Kan.) on a training ride. She was going 50 miles per hour, and I was going 20,” Calwell said. “We collided at 70 miles per hour, I hit the grill, went into the windshield, then I got pulled along the side and got caught under the rear tire. Calwell’s body gradually healed. Five months after the accident, he was told his left leg wouldn’t be amputated. A little more than a year after the collision, he started to get the feeling back in his right arm. By June 20, 1992, his 30th birthday, Calwell was swimming a leg of the Topeka Tinman triathlon. In 2002, he was selected to carry the Olympic torch. “I had goose bumps all over,” Calwell said of his torch run. “When it’s your time, you’ve been thinking about it and you just take off! Then you’re thinking ‘Wait, I’m going too fast,” so you slow way down. A Topeka resident, Calwell said he has fond memories of his hometown and the university. “By my senior year I’d gotten involved on campus, in the student senate, so I was helping to promote Washburn. I was on campus, mowing a yard, and some folks came through. They were all in suits and ties, all in a car; they were lost. They asked for directions, so I gave them directions and didn’t think anything of it. “The day goes on, and as a student senator, I had to host some folks, so I got all cleaned up, dressed ­… well, it was the same people. They didn’t say anything because they didn’t recognize me. So I showed them around campus.